"My life's my own. But I don't have peace of mind. And if you don't have that, you've got nothing. So, what's the answer? That's what I keep asking myself. What's it all about? You know what I mean?" It took some time for me to understand how remaking 1966's Alfie was a top priority. The original film is a fine adaptation of Bill Naughton's stage play and put Michael Caine on the map, but the film is something of an obscurity. Jude Law has replaced Caine and the location has shifted from London and the swinging Sixties to New York and the socially conscious new millennium. It is a daring move for director Charles Shyer and writer Elaine Pope, but the pair handle it very well and their star, dare I say, outdoes his counterpart by leaps and bounds. As the film opens we are introduced to Alfie (Law), a womanizing cad who has a bevy of girlfriends including Dorie (Krakowski), a lonely wife who gets more thrill from Alfie than her husband; Julie (Tomei), a single mom who is the closest thing Alfie has to a steady relationship; Lonette (Long), his best friend's girlfriend with whom Alfie has one night of indiscretion that has ramifications—and two new girls: Liz (Sarandon), who is the film's female match for Alfie, and Nikki (Miller), the "Christmas miracle" he meets on Christmas Eve, the loneliest night of the year. So, what's it all about? 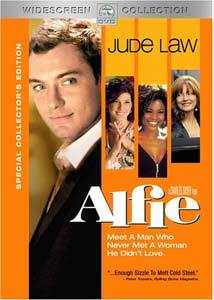 The first half of the film follows Alfie as he goes after any pretty girl he fancies regardless of the outcome. We learn of his plans to open a limo company with his friend Marlon (Epps), though even that is damaged by his womanizing behavior. As the film moves to its second hour things begin to fall apart for Alfie and he is faced with the prospects of being alone, seeing the bitter truths that have come from his actions. By filling the film with a visual flair that reminds the viewer of 1960s London with its costume and production design, Shyer has crafted his own telling of Alfie, which is the one essential ingredient in any successful remake. It doesn't hurt that he has Law as his lead; the incredibly charming star offers a performance that is multi-layered with flashes of cockiness, introspection, and finally, remorse. This is one of the best performances of 2004—a year in which Law himself appeared in six films. That said, while Alfie is a fine filmmaking achievement, it does have one flaw that keeps it from reaching the next level. The script smartly crafts its female characters as strong-willed individuals who don't need men in their lives, most specifically Alfie, and that, while admirable, hurts what made the original film so terrific. In the 1966 version, Caine's Alfie learns a very valuable lesson; here, Alfie just goes from one woman to the next without remorse, and what he learns is to tell a better lie the next time. In the end, the film is a nice experience and decent update of the classic stage play and film. Though it drags in its final act as we begin to see Alfie's assuredness crumble, we don't really care as much as we should as time goes on. Still, this is a worthy successor to the original and is definitely worth a look. Image Transfer Review: The 1.85:1 anamorphic transfer for Alfie is just about as good as they come. It does a great job of recreating the bright and lavish colors that litter the film with no bleeding and only a few very slight instances of noticeable grain. The level of detail in the transfer is its strongest suit, with even the smallest bubbles in a champagne glass coming off incredibly detailed. Audio Transfer Review: The Dolby Digital 5.1 mix does a nice job off recreating the film for a home theater, with the music of Mick Jagger and Dave Stewart coming off nicely in the surround channels. Dialogue is the only other star in the mix and it is clear and crisp with no distortion or dropouts. Extras Review: To be honest, I was expecting Alfie to feature middling extra features, so I was not prepared for the sheer quantity, and quality for that matter. First are two commentary tracks that both feature writer/director Charles Shyer, with co-writer Elaine Pope on one and editor Padriac McKinley on the other. The writers' track is interesting as they talk about updating the film for the new millennium as well as the other changes from the original source material. The other is a more technical track with discussions of shot selection, scenes that had to be trimmed or excised, and the decision to give the film a more European feel. Next is a Round Table featuring Shyer, McKinley, cinematographer Ashley Rowe, and production designer Sophie Becher as they discuss remaking the film and the choice in style and locations. This is an in-depth look at the technical side of filmmaking and those interested in the film and the changes from the original to the remake will enjoy this piece. The Women of Alfie looks at the cast of female characters and compares them to their counterparts in the original film. This is fun to watch to see the differences between 1966 and today, but this is fluff for the most part. Deconstruction of a Scene is a five-minute look at the scene when Alfie rides his Vespa through the streets of New York, and the struggles that ensue thanks to weather and location troubles. Next are eight deleted scenes that offer commentary by Shyer and McKinley. While each deserved to be cut, there is one featuring Tomei that sadly leaves some of her best work in years on the cutting room floor. Let the Music In is a brief but interesting 12-minute take on the collaboration of Mick Jagger and Dave Stewart on the music for the film. As we see rehearsals we are treated to a split screen effect where Jagger and Stewart record on one side of the screen while the scene from the film is played alongside. Finally we get the original theatrical trailer, a storyboard gallery, and a script gallery that looks at six sequences from the film. Alfie is a film that may not be for everyone but with a great transfer and a good collection of bonus materials that are surprising for a film of this type, this disc is a no-brainer. Recommended.